Donovan Pauly, Clifford Restoration Ltd.
Sam Trigila, Clifford Restoration Ltd. 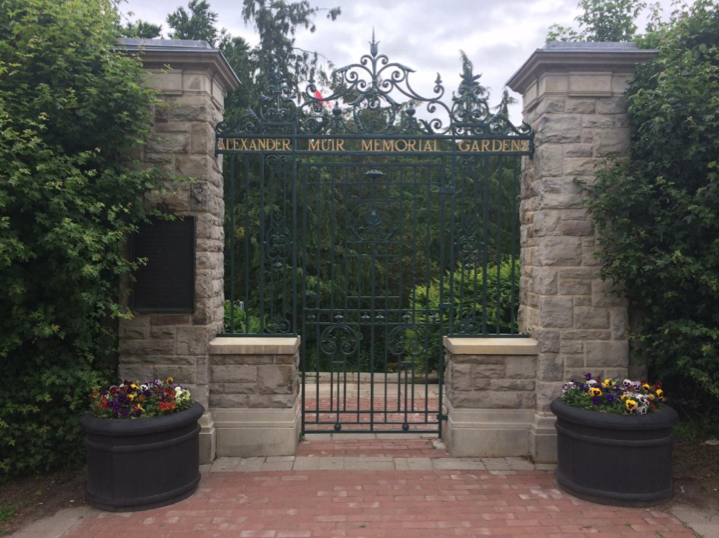 The gateway represents the main entrance into Alexander Muir Memorial Gardens off Yonge Street. The metal work of the gateway was severely deteriorated and the gate was in storage off-site and in similarly poor condition. The masonry piers, part of the gateway assembly, were in need of repointing, cleaning and flashing and the adjacent limestone stairs and retaining walls had to be rebuilt. The project began in February of 2017 with a full audit of the existing metalwork, followed by a paint analysis in April of 2017. On-site work started in June of 2017 with the removal of the metal overthrow and side panels. Metal restoration took place at the workshop of Clifford Restoration, the Heritage Contractor responsible for the project, while work on the masonry and landscaping took place on site. The project was completed in June of 2018.